FOXBORO — John Giguere finished off a pass from Joe Juliano five minutes into the third period to pull Norton into a tie with the Blackhawks in a Tri-Valley League game. The Lancers (0-3-1) received a 20-save performance in goal from Mitch Director, while killing off a Bellingham 5-on-3 power play with five minutes left in the game. Bellingham had taken the lead with a second-period goal. Norton resumes its TVL schedule Saturday in Foxboro with a 5:30 p.m. drop of the puck against Medfield. Former Foxboro High assistant Jay Thebado has taken over as head coach of the Lancer and expresses “a lot of hope with some good players” on the roster, notably flashy forward, senior Brendan Heayden — an All-TVL caliber veteran, and leading scorer Joe Juliano. Senior Mitch Director gets the starting nod in goal with sophomore Collin Lyons as the reserve. “This is his year,” Thebado said of Director, a Sharon High student with the Lancers. Norton’s defensive cast has another All-TVL player in Juliano, a terrific puck-rusher who had nine goals and 16 assists last season. He is working with junior Bill McCarthy. The other pairings have senior John Giguere with junior John Brennan, while senior Jared Parker has been skating alongside junior Matt Zhou. Some of the line combinations to start have junior Pat Lorden between junior Jeremy Cross and sophomore Jared Flueckiger. Another line has junior Pat Donahue centering senior Tom Whalen and senior Matt Pepin.vA third Lancer line has freshman Mike Whalen between sophomore Dom DelGrosso and sophomore Steve D’Ercole. A fourth combination has junior Frank Wang centering freshman Alan Laverdiere and freshman Jake Jackson. The Lancers are led by senior captains Joe Juliano and Brendan Heayden, who will both be relied on heavily by new head coach Jay Thebado. Goalie Mitch Director, a senior at Sharon High, enters the season as the starter and will be a major factor in the teams’ push for a tournament bid. Juniors Pat Donahue (captain), Jeremy Cross, Patrick Lorden, and Billy McCarthy will all look to improve from last season and lead the top two lines. Triton DosReis and Joey Juliano named First Team 2017-18 Sun Chronicle All-Stars! FOXBORO — Triton DosReis posted 18 saves in goal, while Clint Gallagher netted the game-winner early in the second period as the Lancers skated past Bellingham in a Tri-Valley League game. Norton (3-6-2) had 23 shots, but was unable to capitalize on a first period power play and a second period 5-on-3 advantage. Gallagher scored the game-winner at 5:22 of the second period for Norton with Brendan Heayden assisting. DEDHAM — Clint Gallagher collected two goals and three assists while Brendan Heayden had two goals and one assist, as the Lancers (2-4-2) earned a point with a Tri-Valley League tie against the Marauders at the Noble and Greenough School. Norton goalie Triton DosReis totaled 25 saves and collected an assist. BROCKTON - Brendan Heayden launched a wrist shot from the blue line seven seconds into the game and buried the puck in the top corner to give Norton an early edge in its win over Stoughton. Hayden finished with a goal and four assists. Norton went up 6-0, scoring three goals in the first period, two in the second, and one in the third before Stoughton scored twice at the end of the third period. Billy McCarthy notched two goals for the Lancers, while Justin Goldstein (one assist), Joey Juliano, and Patrick Lorden each added one goal. Triton Dosreis made 20 saves in net for the Lancers. (2-3-1). Norton next battles Ashland on January 3rd. FOXBORO - Scoring a trio of third-period goals, two within the final two minutes of play, the Norton High boys’ hockey team notched its first victory of the season and its first-ever Tri-Valley League victory over Dover-Sherborn, skating away with a 3-1 victory at the Foxboro Sports Center. Scoreless through three periods and facing a one-goal deficit entering the final 15 minutes of action, Norton (1-3-1) received the game-winning goal off the stick of Clint Gallagher on a blistering slap shot from center ice at 13:38. Tom Whalen netted the equalizer at 6:48 of the third period unassisted. Goldstein added an empty-net power-play goal for Norton with 33 seconds to go. “We had three lines going,” Eric Grasso, the Norton coach, said of the Lancers’ energy throughout, with goalie Triton DosReis (22 saves) blanking Dover-Sherborn over the first and third periods, allowing only an early second-period goal. FRANKLIN - Clint Gallagher’s goal with 48 seconds left in regulation after Norton High had pulled its goalie earned the Lancers a 2-2 tie with Bellingham High in both teams’ hockey opener Saturday night at Pirelli Arena. Joey Juliano scored Norton’s first goal in the second period on a power play, assisted by Gallagher, whose game-tying goal in the third period was assisted by Juliano and Evan Czazasty. Triton Dosreis made 30 saves in net for the Lancers, who host Medway on Wednesday. Lancers coach Eric Grasso knows he can’t just rely on one scoring line to carry his team through to victory. His squad will need scoring up and down the lineup. But his seven seniors seem committed to turning things around. Goalie Triton DosReis, a captain, will be counted on after parts of two seasons of learning on the job. “He did a lot of growing in the offseason,” Grasso said. Junior Joe Juliano and sophomore Billy McCarthy impress Grasso among his blue liners. Meanwhile, Brendan Heayden and Clint Gallagher will try to improve upon their 12 and 9 goals, respectively. Senior center Justin Goldstein centers the top line. Seniors Evan Czazasty and Tony Cerce, the latter of whom can also play in net, bolster the forward group. Sophomore Patrick Lorden also jumps up from the JV in hopes of providing that necessary scoring depth. Junior defenseman Jared Parker adds to the team’s depth, joining the squad after Norton picked up Sharon as a co-op partner. Sophomores Tim Saunders, John Brennan and junior Matt Pepin will also see time on defense..
Jake Palin named 2016-17 Sun Chronicle All-Star and Taunton Daily Gazette All-Scholastic! Five additional Lancers are named Honorable Mention recipients from the Sun Chronicle and four are named to the Taunton Daily Gazette All-Scholastics Second Team. Congratulations to all players! FOXBORO - Jake Palin and Cam Trudeau each scored a pair of first-period goals, while Triton DosReis notched his second consecutive shutout in goal as the Norton High hockey team kept its MIAA Tournament hopes alive with an 11-0 rout of New Bedford Monday in a non-league game at the Foxboro Sports Center. "High school hockey is all about momentum," said Norton coach Eric Grasso as the Lancers tallied seven first-period goals. "The puck kept going in," and added four more in the second period "we weren't trying to score." Trudeau scored the game-winner for the Lancers (7-10) just 1:51 into the game, assisted by Tom Whalen and Evan Czazasty, while scoring his second goal at 9:25. Palin netted Norton's second goal at 6:35 and Trudeau scored his second goal at 8:59. The Lancers, needing to win to keep their postseason hopes alive, had scored an 11-1 victory over the winless Whalers earlier in the season. Justin Goldstein (at 6:48), Jeremy Cross (at 10:33) and Clint Gallagher (at 13:37) also scored first-period goals for the Lancers. Meanwhile, DosReis had to make just 14 saves for the shutout. During the second period, Conor Gilbert (at 3:20), Jack Loranger (at 5:25), Chris Towne (at 8:04) and Patrick Donahue (at 9:46) scored goals for the Lancers. Norton is back on home ice at the Foxboro Sports Center Wednesday for a Senior Night Tri-Valley League game at 6 against Holliston. FALL RIVER - Jake Palin continued his record-setting scoring pace by netting two goals as the Lancers skated past the Hilltoppers in a non-league game at the Driscoll Arena. Triton DosReis faced just 12 shots in goal for Norton in posting the shutout. Palin scored the game-winning goal for Norton in the first period (at 12:31 from Joe Juliano and Chris Towne) and netted his second goal two minutes into the third period, assisted by Brendan Heayden and Jack Loranger. Evan Czazsty created a two-goal lead for the Lancers at 4:22 of the second period with Justin Goldstein and Clint Gallagher assisting. Norton (6-10) tries to keep its MIAA Tournament hopes alive Monday afternoon in Foxboro with a 3:40 p.m. game against New Bedford. H.S. HOCKEY: "Norton closes in on tourney bid"
NEW BEDFORD - Jake Palin produced two goals and two assists, while Brendan Heayden had three points as the Norton High hockey team skated past New Bedford 11-1 Friday in a non-league game at the Hetland Arena. The Lancers (4-8) scored four goals in each of the first two periods, while goalie Triton DosReis blanked the Whalers over the first two periods, totaling 24 saves overall. Palin gave Norton a 3-0 lead at 1:30 of the first period and scored on the ensuing faceoff at 1:57. Heayden gave Norton an 8-0 lead with his goal at 8:42 of the second period. In addition to the pair of first-period goals by Palin, Cam Trudeau (at 0:30) and Chris Towne (at 2:03) also scored goals, as Norton tallied three times within the first three minutes of the contest. Joe Juliano (at 2:59), Clint Gallagher (at 3:39), Jack Loranger (at 5:48) and Heayden scored second-period goals. During the third session, Matt Pepin (at 1:00), Bill McCarthy (at 8:45) and Jeremy Cross (at 13:15) added goals. FOXBORO - The Lancers tallied a trio of first-period goals, while Triton DosReis totaled 19 saves in goal for the shutout as Norton skated past the Hilltoppers in a non-league game. Brendan Hayden (at 8:04 from Jake Palin and Clint Gallagher), Evan Czazasty (at 9:05 from Justin Goldstein and Pat Lorden) and Gallagher (at 10:47, shorthanded) put Norton in front 3-0 after 15 minutes. After a scoreless second period, Jack Loranger (at 11:21 from Chris Towne and Palin on the power-play) and Goldstein (at 12:53) closed out the Lancer scoring. The Lancers (3-4) travel to Holliston for a 5 p.m. game Saturday. FOXBORO - Three times the Norton High hockey team took the lead. And three times, the Foxboro High Warriors charged back to score the equalizer. Eventually it was senior Jack Loranger's second goal of the game, with 24 seconds remaining on the clock, that enabled Norton to regain the lead for a fourth time and take a dramatic 5-4 decision over Foxboro in the non-league contest. "The kids wanted to win this one for Billy," beamed Norton High coach Eric Grasso as the Lancers lost freshman forward Billy McCarthy to a back injury in a collision with a Foxboro player with five minutes left in the second period. "We're playing much better hockey right now," said Grasso as junior goalie Triton DosReis limited Foxboro (1-4) to one goal in each of the first and third periods, totaling 25 saves overall. Jake Palin and Brendan Heayden set up Loranger's game-winning goal and also his first goal, that in the 13th minute of the second period which regained the lead at 3-2 for Norton. "We just came up short," said Foxboro coach Mark Cedorchuk, the Warriors receiving a four-point performance from Mike Caresi. "We've got to do a better job in front of our net." Foxboro's John Dolan scored the equalizer for the Warriors with 22 seconds left in that middle session. Sophomore Tom Whalen scored his second goal of the game, with Tony Cerce assisting, at 2:25 of the third period to claim a 4-3 lead for Norton. But, once again Foxboro knotted the score in the 11th minute with Caresi scoring. Foxboro had taken its lone lead of the game at 3:16 of the first period with Kyle McInnis scoring. But Norton tied the score just 1:09 later when Clint Gallagher tipped in a drive by Cam Trudeau. Whalen gave Norton its first lead, at 2-1 at 5:39 of the second period with Pat Lorden and Connor Gilbert assisting. But Sam Garabrand tied the score at 2-2 for Foxboro in the eighth minute. Norton (2-4) returns to the ice for a non-league game with Durfee on Jan. 4, while Foxboro has a non-league game that day against St. John Paul in Foxboro. FOXBORO - Senior Jack Loranger scored on a breakaway in the second period and also assisted on two other goals to back the stellar goaltending of Triton DosReis as Norton High opened its 2016-17 hockey season with a 4-0 blanking of Foxboro Thursday. Senior Jake Palin opened the scoring with 6:16 left in the first off assists from Brendan Heayden and Loranger. Junior Justin Goldstein gave the Lancers a 2-0 lead at the end of the first period, with assists to Evan Czazasty and Loranger. Then Loranger got his own goal with 3:36 left in the second period to lift Norton to a 3-0 lead, and sophomore Joe Juliano completed the scoring late in the third period on an empty-net goal, with assists to team captain Cam Trudeau and Clint Gallagher. DosReis, a junior, notched 28 saves in backstopping the victory, although overall team defense was equally important, as Trudeau, Juliano, and Chris Towne spearheaded the Norton effort. Norton (1-0) will next host reigning Division 2 state champion Medfield on Saturday. In the lone boys opener of the night, Triton DosReis made 20 saves and Norton blanked Foxboro, 4-0, at the Foxboro Sports Center. Jake Palin and Justin Goldstein gave the Lancers a 2-0 lead after one, Jack Loranger added a breakaway goal in the second then Joe Juliano capped it with a late empty-netter. ABOUT THE LANCERS: Norton handled itself admirably in its first season in the tough TVL after two years skating as an independent. Now comes the quest to take the next step in the program’s development with Grasso back for his second season behind the bench. Seniors Jack Loranger and Jake Palin have been with the program since its inception and are top forwards along with sophomore Brendan Heayden, a three-year veteran. Defensively, senior captain Cameron Trudeau and senior Chris Towne (converted forward) shore up the blue line. “We expect our program to continue to make strides and fight for a playoff berth this season,” Grasso said. After playing an independent schedule for the first two years of their program’s existence, the Lancers made their TVL debut last season finishing a surprising seventh in the nine-team league. They will look to improve on that mark returning last season’s leading scorer, senior assistant captain Jake Palin (7g, 8a), sophomore Brendan Heayden (4g, 6a) and senior Jack Loranger (6g, 3a). Anchoring the defense will be stand out senior captain Cam Trudeau, senior Chris Towne and sophomore Joe Juliano, who missed the entire 2015-16 season with an injury. A large junior class will be expected to make key contributions led by three uniquely talented players that play goalie, but also spend time adding depth to the forward lines and defensive pairings when not tending goal. Most of the netminding duties will fall on Tony Cerce (team leading 2.47 GAA) and assistant captain Triton DosReis with spot starts by the leading scorer from the trio in Clint Gallagher (4g, 4a). The Lancers won five games and did not qualify for the MIAA Tournament, but coach Eric Grasso firmly believes that the experience from many a four- and three-year starter and skating skills will make for an invigorating winter season. Norton scrimmaged North Attleboro and Dighton-Rehoboth/Seekonk, and then shut out Foxboro 4-0 in their season opening game - "A sign of things to come," said Grasso, who has a pair of three-year veterans in junior goalies Tony Cerce and Triton DosReis. Senior Cam Trudeau, a four-year veteran, anchors the defensive cast that includes senior Chris Towne and sophomore Joe Juliano, who missed all of last season with a broken collarbone. Junior Clint Gallagher, who can also fill in at goalie, centers one Lancer line with junior Justin Goldstein and Evan Czazasty. Another Lancer line has senior Jake Palin centering for senior Jack Loranger at right wing and impressive sophomore Brendan Heayden, who is in his third varsity season. The Lancers are due for a breakthrough season, having four seniors and 10 juniors on the roster. "I looked at our first TVL game (with Medfield), and in every period we had scoring chances," said Grasso. Trudeau was an important contributor on and off the ice for the fledgling Lancer program during his three years. With Norton competing in the tough Tri-Valley League for the first time this season, the senior captain was named second team All-TVL. The standout forward finished second on the team in scoring with 6 goals and 7 assists for 13 points. Trudeau completed his stellar career as the all-time leading scorer in program history. He finished with 26 goals and 23 assists for 49 career points. Last year as a junior, Trudeau led the team in scoring with 11 goals and 9 assists for 20 points. His play was key as the Lancers reached the MIAA Division III South Sectional a year ago with an 8-7-4 mark. As a sophomore, Trudeau was second on the team in scoring with 9 goals and 7 assists for 16 points. HOPEDALE — Bobby Trudeau’s power play goal three minutes into the second period gave the Lancers a two-goal lead and proved to be the game winner for Norton in the Tri-Valley League game. Lancer goalie Tony Cerce turned aside 37 Panther shots, but it was some sterling defensive work, led by Jon Giguere, over the final four minutes of the game that killed off consecutive Holliston power play chances. The Lancers (5-10-3) moved into seventh place in the TVL with the win. Trudeau’s game-winner was assisted by Cam Trudeau and Jake Palin. Holliston scored 20 seconds in, but Norton tied it less than a minute later when Palin converted a forechecking effort by Jack Loranger. Norton took the lead at the six-minute mark as Matt Loranger scored his second goal of the season with Conor Gilbert assisting. The Lancers travel to Foxboro Sports Center Monday for an 8 p.m. The roster for the “Coastal” hockey team for the Bay State Games reads like a who’s-who of local players: North Attleboro High forwards Jason McNeany and Erik Clements, Bishop Feehan High defensemen Josh Nelson and Sean Dunphy and forward Kevin Jezard; Norton residents Patrick Robles (St.
FOXBORO - Senior captain Matt Loranger scored his first goal of the season and goalkeeper Triton DosReis moved out of the cage to the forward line and scored his first career goal as the Lancers celebrated Senior Day with a rout of the Whalers in a non-league game. The Lancers (4-10-3) scored three first period goals and took control of the flow of play such that Tony Cerce recorded the shutout in goal, having to make just eight saves, four during the second period. DosReis scored the final goal of the game for Norton, that at 3:48 of the third period. In addition, Bobby Trudeau, Clint Gallagher, Connor Gilbert, Jack Loranger, Jon Giguere and Justin Goldstein also scored goals. The Lancers next have a Tri-Valley League game Wednesday (7:30 p.m.) at Holliston. Lancers Earn First Tri Valley League Win In Program History! FRAMINGHAM — Jake Palin scored both goals for Norton, the second on an empty-netter with just under one minute to play as the Lancers skated past the Clockers for Norton High’s first-ever victory in a Tri-Valley League game. Palin scored the game-winner on an unassisted goal at the seventh minute of the first period, intercepting a pass in the Norton defensive zone, splitting the defense and then beating the Ashland goalie with a low wrist shot to his stick side. Supported by strong defensive play from captain Matt Loranger and Cam Trudeau, goalie Clint Gallagher totaled 24 saves in goal for the shutout victory. The Lancers (3-10-3) take on New Bedford Saturday in Foxboro on Senior Day. HOPEDALE - Freshman Brenden Heayden scored what turned out to be the game-winner for Norton in the first period, corralling a rebound and burying the puck under the crossbar to aid the Lancers at the Blackstone IcePlex. The defense and the penalty-killing of the Lancers prevented Millis from evening the score by killing dual penalties in the second period and another in the third. Goalie Tony Cerce shut out Millis, totaling 23 saves. Camped out in front of the net, Heayden was able to push the puck past the Millis goaltender off a shot from the point by Jake Palin. Bobby Trudeau, who also assisted on Heayden's goal, tallied an empty-netter in the dwindling seconds of the third period. Norton (2-4-3), which has not lost a game in its last five (2-0-3), will play Westwood Monday at Nobles Rink. NEW BEDFORD - Sophomore Justin Goldstein accounted for a second period "hat trick," as the Lancers broke into the win column for the first time with a non-league victory over the Whalers. Jack Loranger scored the game-winner for Norton at 5:10 of the first period, while goalie Triton DosReis had to make just 12 saves for the shutout. Goldstein scored his first goal at 4:34 of the second period (from Cam Trudeau), an unassisted goal at the nine-minute mark and his third goal at 11:08 (assisted by Connor Gilbert). Clint Gallagher netted two goals and Jake Palin had two assists for the Lancers (1-4), while freshman Tom Whalen scored his first goal and John Silvia also tallied. The Lancers travel to Hopedale Saturday for a 5:30 p.m. faceoff in a Tri-Valley League game against Millis. FOXBORO - Brendan Heayden put the Lancers into the lead during the second period, but the Hilltoppers netted the tying tally with a minute left in the non-league game after pulling their goalkeeper. The Lancers totaled 28 shots, but also were whistled for eight penalties. Tony Cerce was in net for Norton (0-4-2), which returns to the FSC ice Saturday night for a 7:30 p.m. start against Ashland. BROCKTON - Third period goals off the sticks of Bobby Trudeau and Jake Palin rallied the Lancers from a two-goal deficit in a point well taken in the non-league game at the Asiaf Arena. Palin scored the tying tally for the Lancers with two minutes remaining, assisted by Trudeau. The same duo reversed roles in putting Norton on the scoreboard five minutes into the third period. "We knew we would come back," said Norton coach Eric Grasso. "Our guys were positive on the bench and we played really strong on defense." Stoughton took the lead in the final minute of the first period and added a second period powerplay goal in the 10th minute. Lancer goalie Tony Cerce totaled 25 saves, blanking the Black Knights over the final 15 minutes. The Lancers (0-4-1) next host Durfee on Wednesday night at 7 in Foxboro. ABOUT THE LANCERS: This will be quite a transition year for Norton entering its third season of varsity play. Not only are the Lancers jumping into the TVL for the first time, where they will play a handful of opponents only once, but they have a new coach as Grasso comes over after a season with the Westwood girls. Senior defenseman Matt Loranger and forward Bobby Trudeau will carry the Lancers along with junior forwards Jack Loranger, Jake Palin and Chris Towne. Junior Cameron Trudeau and sophomore Clint Gallagher. Sophomores Triton Desrios and Anthony Cerce are the goaltending tandem. Eric Grasso is the new face of the Norton High boys' hockey program, replacing Kyle Heagney, who resigned after two seasons owing to professional and personal duties. Grasso, who once served as an assistant coach with the Attleboro High hockey program, was an assistant coach at Walpole High for two seasons. Last year, he guided the Westwood High girls' varsity program. He is a graduate of the 1999 state championship Mt. St. Charles Academy hockey team. "I am really looking forward to the position," said Grasso, who also serves as the volleyball coach at Norton High. The Lancers will no longer be an independent, but a member of the highly competitive Tri-Valley League beginning in the 2015-16 season. "I thought that Kyle would be there for 10 years, he did such an amazing job and I can't speak enough about what Rick Palin has done for the program, getting it going," Grasso said. "I know the program has a lot of great kids, some depth at goalie, I'm really looking forward to the first day of practice." Norton Lancers Bobby Trudeau & Troy Parker are 2015 Sun Chronicle All-Stars! Jake Palin & Cassandra Goyette receive Honorable Mention. Click this text for All-Star player summaries and logo at left for a link to the complete story. FOXBORO - In just their second season as a hockey program, the Lancers are in the MIAA Tournament, having secured the two points necessary to advance into postseason play with a non-league win. Bobby Trudeau scored two goals, including the game-winner just 2:08 into the second period as the Lancers (8-5-4) have already doubled their win total from last season as well. The Lancers return to the ice this morning at 11 in Natick for a non-league game with Dover-Sherborn. Cassandra Goyette tended goal for the Lancers, allowing just two goals over a four-minute span to Durfee midway through the second period (one on a power play at 6:29) and then foiling the Hilltoppers on a trio of third period power play chances. Clint Gallagher netted the fourth goal for the Lancers at 7:54 of the third period, to create a two-goal advantage, scoring off his own rebound. Norton scored twice during the first period and never lost the lead. Matt Loranger gave the Lancers the lead at 3:42, assisted by Jake Palin and Parker with a slap shot from the point. Trudeau then scored the first of his two goals at 10:53 with Loranger and Parker assisting. "Norton Still In Tourney Hunt After Tie"
ROCKLAND - The line of Troy Parker, Bobby Trudeau and Brendan Heayden accounted for three goals and five assists in Norton High's 6-3 hockey win over South Shore Voke Saturday at Rockland Arena. "I thought they really carried the play for us," said Norton coach Kyle Heagney. South Shore Voke opened the scoring early in the first period, but Trudeau tied it with a goal at the 5:38 mark of the period, assisted by Jack Loranger and Parker. A half-minute later, Heayden put the Lancers (7-5-3) ahead to stay with the first of his two goals, assisted by Parker and Trudeau. Norton scored twice more in the period to take a 4-1 lead on goals by John Levy (Tony Cerce assist) and a power-play strike by Jake Palin (Trudeau and Heayden assists). Norton got two more goals from Matt Loranger (Parker and Maverick DosReis assists) and Heayden (Parker and Trudeau assists). Clint Gallagher earned the win in net. FOXBORO - Pete Smith's late third-period goal earned Foxboro High a 2-2 tie with Norton Sunday night at the Foxboro Sports Center. After a scoreless first period, Norton High got a goal from Tony Cerce with 32 seconds left in the second period, assisted by Jake Palin and John Giguere, to open the scoring. The Warriors tied it at 13:06 of the third period on a goal by Tim Luciano, assisted by Zach Willis and Aidan Sullivan. Less than four minutes later, Bobby Trudeau put Norton back on top, 2-1, with Palin earning his second assist, but with 5:11 to play, Smith lit the light to salvage the tie for the Warriors. Norton (6-4-3), which outshot the Warriors, 20-18, needs five more points to qualify for the MIAA tournament. BOURNE - Senior captain Troy Parker scored two goals and collected an assist as the Lancers (6-3-2) swept the season series with the Vikings and moved closer to an MIAA Tournament berth. Backboned by the sterling play of goalie Triton DosReis (20 saves, including foiling a breakaway bid on a potential game-tying second period goal), the Lancers scored a pair of second period goals and held off the Vikings with Parker scoring his second goal, an empty-netter with 21 seconds left. Parker scored what proved to be the game-winning goal at 7:34 of the second period on a power play to build a 2-0 lead for Norton. The Lancers had taken the lead at 4:32 of that session when Parker (and Brendan Heayden) set up Bobby Trudeau for a power play goal. The Vikings scored their lone goal on a power play in the eighth minute of the second period. "DosReis played the best game of his career," noted Norton coach Kyle Heagney of the key ingredient for the success. Norton needs three wins in order to advance into the MIAA Tournament, its next game being against East Boston Saturday evening at 8 in Foxboro. "Trudeau's Hot Hand Lifts Norton Over Durfee"
BOSTON - Senior captain and left wing Troy Parker converted a rebound of a Bobby Trudeau shot at 6:21 of the third period, the game-winning goal for the Lancers in the non-league game. Norton (4-3-1) moved above .500 for the first time in program history, overcoming two scoreless periods and staving off a pair of East Boston power plays during the third period. Lancer goalie Tony Cerce totaled 23 saves, blanking East Boston in the first and third periods. "It was a close, physical game, we had to fight for every inch," said Norton coach Kyle Heagney. Brendan Hayden scored the tying goal for the Lancers just 20 seconds into the third period with Cam and Bobby Trudeau assisting. first two periods in front of goalie Triton DosReis, who had to make just six saves. in the second period and then setting up Silvia’s goal with 2:32 left in the game. Sophomore Jack Loranger notched the winning goal just 2:15 into the game. The Lancers broke open the game by scoring twice in the final two minutes, courtesy of Cerce at 13:11 from Matt Loranger and Lee, and then Matt Loranger at 14:44, assisted by Jon Levy. Cam Trudeau (at 8:58 from Evan Czazasty) and Jake Palin (at 10:58 from Gallagher) added second period goals for the Lancers. FOXBORO - Clint Gallagher stopped all 26 shots he faced for the shutout, backstopping the Lancers to the non-league win. "His game was tremendous. He really kept us in the game in the first and second periods, the first period especially, when we were sloppy," said Norton coach Kyle Heagney. Defenseman Matt Loranger scored for Norton with 4:25 left in the first period, a shot from the point with assists to Mavrick Dosreis and Bobby Trudeau. That was all the scoring until the last five minutes of the game as the two teams traded chances in the second and third periods. Brian Cronin finally tacked on an insurance goal for Norton with 4:33 to play, knocking in a rebound of a shot by eighth-grader John Giguere. Then, with just 1:52 to play and Norton on the power-play, Trudeau ripped home a point shot after a feed from Jake Palin. Aside from Gallagher's play in net, Heagney also noted the defensive work of Loranger. Norton (2-3-1) is off until next Tuesday's game against O'Bryant. FOXBORO - Sophomore forward Jack Loranger accounted for a hat trick, scoring a pair of third-period goals within a 37-second span, while freshman Clint Gallagher turned aside 25 shots, blanking the Vikings through the final two periods of play as the Lancers won the non-league game to break into the win column for the first time this season. "Our defense played a key role," said Norton coach Kyle Heagney as the Lancer defense allowed Gallagher to see the puck and clear whatever rebounds remained. Loranger tied the game for Norton with 33 seconds left in the first period, Jake Palin and Bobby Trudeau assisting. But, it was eighth grader Brendan Heayden scoring his first Lancer varsity career goal, that just 3:14 into the third period that proved to be the game-winner. Loranger netted his second goal (with Cam Trudeau assisting) at 11:25 of the third period and his third goal (with Palin and Bobby Trudeau assisting again) at 12:02. Senior Mav DosReis gave Norton a two-goal lead at 4:04 of the third period. Norton next participates in the Bellingham Holiday Tournament on Monday (8:30), meeting the host Blackhawks. ABOUT THE LANCERS: With a full year of the program under their belt, Heagney and Norton have a much better idea of what they’re facing entering Season 2. “Last year was kind of like running through the forest blindfolded and hoping not to hit a tree,” Heagney said. This year it will start with a solid top line of junior Bobby Trudeau and sophomores Jake Palin and Jack Loranger. “They’re going to have to be a big part of our production this year,” Heagney said. Freshman Justin Goldstein, eighth-grader Brendan Heayden and sophomore Chris Towne form the second line, followed by senior Mavrick DosReis, junior Jonathan Levy and eighth-grader Tom Whalen. Heagney believes the defensive core is solid with senior Troy Parker, sophomore Cam Trudeau and junior Matt Loranger. In net are freshmen Tony Cerce and Clint Gallagher, who also could skate in any given game, along with senor Cassandra Goyette and freshman Triton DosReis. “You could throw a blanket over all four goalies,” Heagney said. Skating onto the ice for their second season of varsity hockey with five victories and a tie to show for their maiden season, the Norton Lancers are not quite ready to become a full-fledged member of the Tri-Valley League. With a pair of teams playing in the middle school league at the Lancers' home base of operations, the Foxboro Sports Center, coach Kyle Heagney envisions better depth and better talent funneling through the ranks. The Lancers' defensive cast includes senior captain Troy Parker (eight assists), usually paired with freshman Clint Gallagher, while senior associate captain Mav DosReis is paired with sophomore Cam Trudeau. In goal for the Lancers will be senior captain Cassandra Goyette. The Lancers have a very good first line with junior Bobby Trudeau and two sophomores, Jack Loranger and Jake Palin (five goals, eight assists). At the moment, another line has freshman Justin Goldstein, sophomore Chris Towne and eighth grader John Giguere. A third unit will consist of juniors Brian Cronin and Jon Levy with a revolving cast. "We working on our execution and we're looking for a few finishers," said Heagney as the Lancers, unexpectedly, lost their top two incumbent scorers from last season, sophomore Patrick Robles (a team-best 13 goals with eight assists) and freshman Ryan Kuzmich (nine goals and four assists). Robles transferred to the Hill School in Marlboro, while Kuzmich opted to transfer to Southeastern Regional. "That makes a huge difference," added Heagney, hoping the increased ice time for others will create goals. "There's no lack of effort by the kids, they bring a lot of energy as we continue to develop." FOXBORO - Freshman Pat Robles netted a pair of goals and Cam Trudeau picked an opportune time to score his first goal of the season, the game-winner too, as the Lancers notched their third straight victory, holding off the Hilltoppers in a non-league game at the Foxboro Sports Center. Norton never trailed, assuming a 3-0 lead in the second period before Durfee tallied twice before the session ended. Tony Cerce and Cassandra Goyette shared the goal tending duties for Norton, combining for 18 saves. Norton (5-12-1) totaled 31 shots on goal, out shooting the Hilltoppers in every period. Goals by Jon Levy (at 11:30 from Bob Trudeau) and Robles (at 14:22) gave Norton a two-goal lead by the end of the first period. Robles scored his second goal just 1:14 into the second period, with Jake Palin and Matt Loranger assisting to create a 3-0 advantage. Cam Trudeau uncorked a slap shot from the point at 9:05 of the third period with Troy Parker assisting for the game-winner, while Bob Trudeau made a nifty rush between a trio of defenders for goal No. 5 at 12:44. FOXBORO - Jake Palin scored a pair of power-play goals, as the Lancers led by as much as three goals in the non-league contest. Ryan Kuzmich added a goal and an assist, while Patrick Robles scored on a full-ice rush. In all, Norton (4-12-1) enjoyed a 26-21 advantage in shots, with Lancers goalie Tony Cerce turning aside 19 South Shore offerings. "They played really well in all three periods," said Norton coach Kyle Heagney. Norton hosts Durfee Friday. FOXBORO - Connor Russell had a goal and four assists while teammates Nate Barrette and Ryan Kuzmich both scored twice as the Lancers routed O'Bryant for the second time this season. After beating O'Bryant 11-1 earlier in the season, Norton jumped out to a 6-0 lead after the first period of this one. Russell had a four-point period, scoring once and assisting on three others. Barrette had the first two goals of the game, both assisted by Russell, as the Lancers went up 5-0 barely 10 minutes in. Patrick Robles had a goal and three assists; Conor Gilbert, an eighth grader, had his first varsity goal and an assist; Jack Loranger and Jake Palin both had two assists; while Jonathan Levy, Matt Loranger and Clint Gallagher, who also dresses as a backup goalie, scored goals, Gallagher his first with the varsity. The beneficiary of all the offense was goalie Cassandra Goyette, who faced just eight shots. "Just really proud of the team and the way they skated," said Norton coach Kyle Heagney. "A lot of first-time goals, so it's good to ride home with a win like that. I'm really happy, this team has improved drastically since the start of the season." Now 3-12-1, Norton skates with South Shore Voke on Wednesday. Norton - 11 O'Bryant - 1 "Lancers Net First Win"
A historic night for Norton High School as the Lancers take the ice for the first MIAA varsity hockey game in the school's history. Despite the game result it was an amazing evening for our program! "Norton falls in hockey debut"
"Eight Area Squads Set to Face Off in Sectional Play"
Norton Qualifies for the MIAA tourney in just second year of varsity program's existence! "As coach at Norton, Attleboro Police Chief Kyle Heagney teaches life lessons"
"Norton High Student (Troy Parker) Leads HS Locker Room Project"
There will be one less boys hockey program in the state this season, although it isn’t a matter of simple subtraction. That’s because Norton will make its debut on the ice this season, playing as an Independent with an eye on eventually entering the Tri-Valley League. The Lancers will debut Dec. 21 (6:50 p.m.) against Wareham/Carver at the Foxboro Sports Center, where they will play home games. Kyle Heagney, a former assistant at Bishop Feehan, will have the reins of the Norton program in its inaugural season. In their first varsity season and playing an independent schedule before seeking membership in the Tri-Valley League, former Bishop Feehan High assistant coach Kyle Heagney is directing Norton. "We're bringing a lot of energy, a lot of effort, a lot of excitement," said Heagney. "We have a lot to build from." The Lancers have a home base of operations at the Foxboro SportsCenter and so the learning curve will begin. There are only two seniors on the roster, forwards Nate Barrette and Connor Russell, thus Norton sought an MIAA waiver to include five eighth graders on the team to lend some depth. Two of those are goalkeepers - Tony Cerce and Triton DosReis - who are in contention with junior Cassandra Goyette for the starting spot. The Lancer defensive cast will be tested. Juniors Mavrick DosReis and Troy Parker are the most veteran of the group, though sophomore Matt Loranger and freshman Cam Trudeau will often be on the ice. Up front are sophomore forwards Brian Cronin, Jonathan Levy and Bob Trudeau. A first line might incorporate Trudeau and two freshmen, Jake Palin and Pat Robles. "With only two seniors, we still have some decent size," said Heagney, "and the eighth graders show a lot of promise." 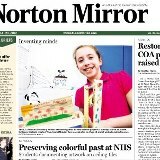 "Norton will make its debut as a varsity hockey program"
﻿Attleboro's police chief will coach new Norton hockey squad"